The 8th King is the apex sovereign symbol represented by the “King of Fierce Countenance” and “King North” as globalized world government. All the national sovereign powers in the historical outline of prophecy also converge into this super-sovereign 8th King. In fact al the details are already in this prophetic climax. Daniel 8:23ba: ” there will stand up a king fierce in countenance and understanding ambiguous sayings. Daniel 8: 24a: “And his power must become mighty, but not by his own power. Daniel 8:24b: “ And in a wonderful way he will cause ruin, and he will certainly prove successful and do effectively. Daniel 8:24c: “ And he will actually bring mighty ones to ruin, also the people made up of [the] holy ones. Daniel 8: 25a: “And according to his insight he will also certainly cause deception to succeed in his hand. Daniel 8:25b: “ And in his heart he will put on great airs, and during a freedom from care he will bring many to ruin. 25c: ” And against the Prince of princes he will stand up, but it will be without hand that he will be broken. Daniel 11:36b ” and against the God of gods he will speak marvelous things. 2. Obviously the USSR did NOT ” prove successful until [the] denunciation will have come to a finish”, and is not the true King North of Daniel 11:31-45 which is solely the 8th King globalists. 4. 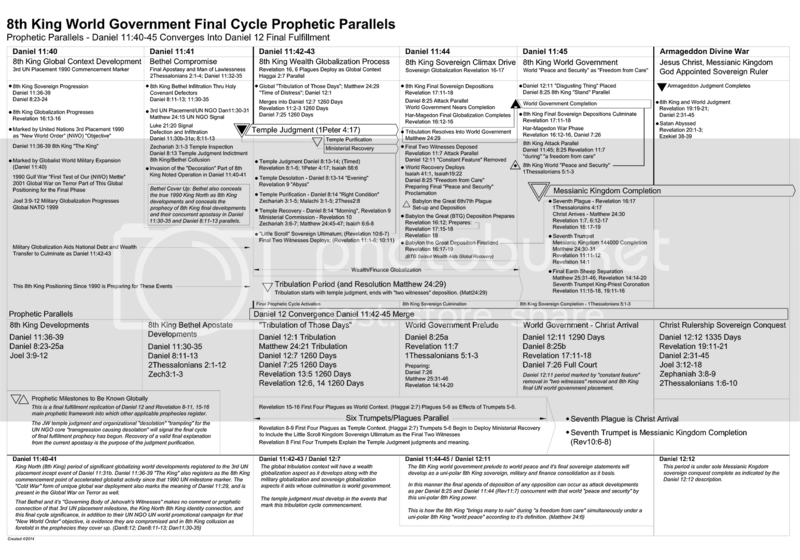 This spans over the final overall phase of 8th King development from 1990 3rd UN manifestation (Dan11:31b) and globalist activity (Dan8:23-24; Dan11:36-41) to Armageddon (Dan11:45; 12:11), non-stop, over some final years of prophecy and world development. Daniel 11:36d: “ because the thing decided upon must be done. Daniel 11:37b: “ and to the desire of women and to every other god he will give no consideration, but over everyone he will magnify himself. Daniel 11:38b: “ and to a god that his fathers did not know he will give glory by means of gold and by means of silver and by means of precious stone and by means of desirable things. Daniel 11: 39a: “And he will act effectively against the most fortified strongholds, along with a foreign god. 2. Bethel is a spiritually “fortified stronghold” (“fortress” Dan11:31a) that is also overtaken by the 8th King in the principle of this 8th King superiority of strategy and infiltration. Daniel 11:39d: ” and [the] ground he will apportion out for a price. A. The Gulf War was a unique global coalition tied to “new world order” objectives in that campaign by statements of George Bush Sr. Thus it marks a particular first wave of globalist 8th King world military positioning in anticipation of the final cycle. Daniel 11:40c: “ and he will certainly enter into the lands and flood over and pass through. Daniel 11:41b: “ and there will be many [lands] that will be made to stumble. Daniel 11:41c: “ But these are the ones that will escape out of his hand, Edom and Moab and the main part of the sons of Ammon. Daniel 11:42b: “ and as regards the land of Egypt , she will not prove to be an escapee. Daniel 11: 43: “And he will actually rule over the hidden treasures of the gold and the silver and over all the desirable things of Egypt. Since prophetically and logically Babylon the Great is most useful during the final 8th King world tribulation phase in more ways than one, we can see Bethel claiming “Babylon the Great is attacked first” merely aids concealment of the Biblical prophecy fact the “house of God” is where the “attack” begins in temple judgment. It is Jehovah’s witnesses and the global “Bethel” worldwide organization that is attacked first as per prophecy. That 8th King first “attack” is the parallel of the Daniel 8:13-14 8th King “trampling” of the Bethel “a system of things” (Matt13:36-42) due to the UN NGO “transgression causing desolation”. And no wonder the very prophecies exposing the 8th King and Bethel developments in Daniel 8:11-14 and Daniel 11:30-32 are also the ones Bethel conceals with fiction since 1990 events made it apparent their “interpretations” are invalid, even purposefully deceptive to aid their 8th King partners. Daniel 11:44c: ” and he will certainly go forth in a great rage in order to annihilate and to devote many to destruction. 2. That 8th King ascension must honor the principle of the second UN placement “ascension” of 1945 after World War 2 at Revelation 17:8-11. 1. That is the “denunciation brought to a finish” that the successful 8th King arrives at in a final 8th King developmental overall continuum of Daniel 11:30-45. 2. The ” Michael will stand up” is ultimately Jesus Christ “standing” into complete Messianic Kingdom power to respond to the 8th King now completed world government’s affront to his sovereign supremacy to be finalized in this period. 1. The co-developing feature to that 4th UN “placement” is the ” constant [feature] has been removed”. That event finality is the final “two witnesses” deposition of Revelation 11:7. Thus the initial intrigues of the 8th King final progression must have a final Bethel objective to attempt to finalize the ministerial cessation, already in operation in prophetic inaccuracy purposely now part of the Bethel theological policy. That whole operation must finalize. 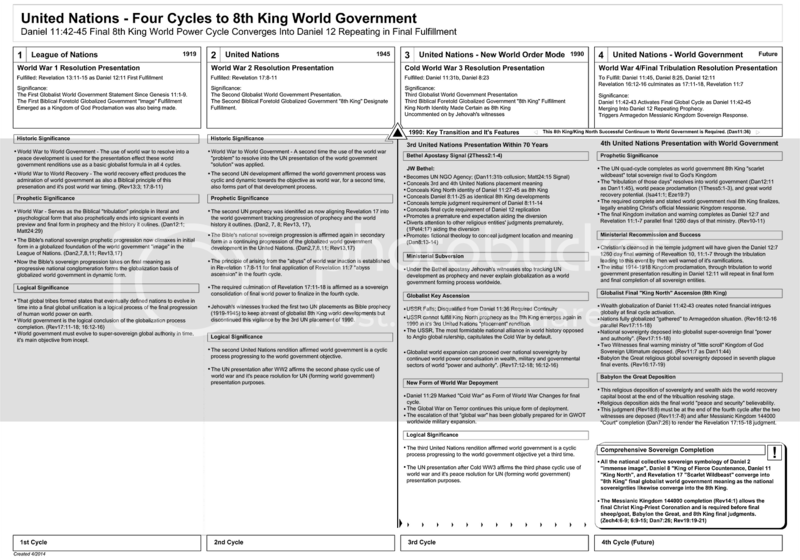 Now the 8th King has positioned the world system in many ways for this final cycle, and Bethel is not commenting on many publicly known aspects of globalization and international massive debt processes that will facilitate the final cycle objectives of the 8th King system. Now the very ministry that used to track this 8th King rival world government development as prophecy has ignored the 3rd UN placement significance of 1990 as either prophecy or significant in world government development. Instead Bethel became a UN NGO co-promoter of the 8th King system. God’s purpose in the temple judgment is instead a UN NGO accounting and then a ministerial recovery by temple purification “right condition” of Daniel 8:14 being reached in this process. Thus as the final cycle unwinds over several last years, God provides timings to affirm milestones as a final Messianic Kingdom completion proclamation will soon accompany the 8th King trek to the end of the road. (Daniel 7: 26) And the Court itself proceeded to sit, and (8th King) his own (completed sovereign rival) rulership they (Messianic Kingdom power) finally took away, in order to annihilate [the 8th King] and to destroy [the 8th King] totally.